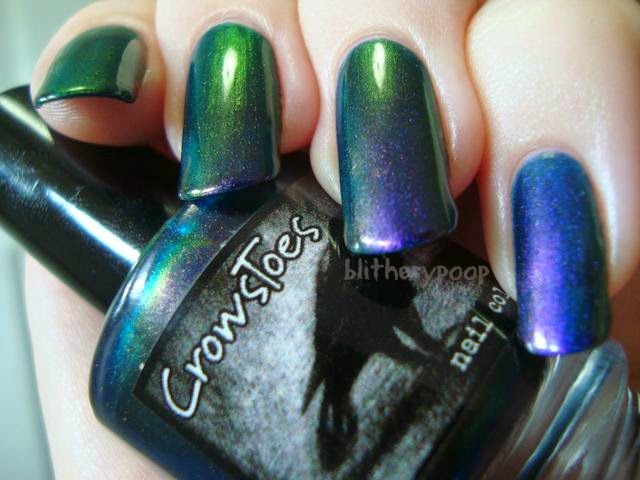 With their dark themes and gorgeous shimmers, I always had it in the back of my mind that when I did eventually succumb to indie polish CrowsToes would be the first. Turns out it wasn't. It was the second...and for a weird reason. My first Llarowe order went several kinds of wrong. To make it up to me, they gave me "store credit", so I placed a second order. Huginn & Muninn was the first thing that went into my cart. I'd been sighing over swatches of the 9 Realms collection in general, but this one in particular. It's so...me. 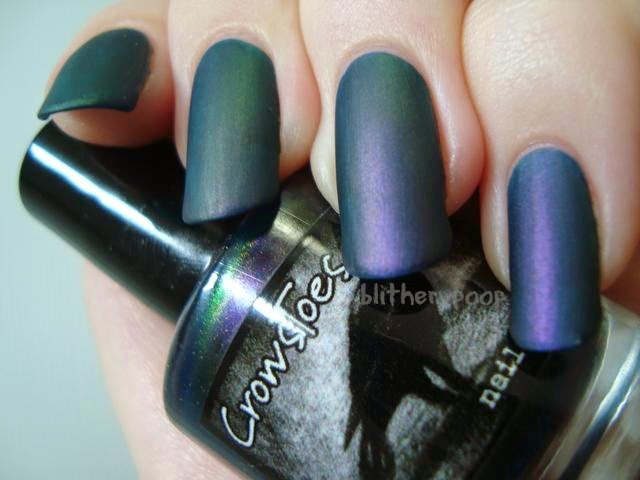 Huginn & Muninn has purple/gold/green multichrome shimmer in an indigo jelly base. As much as I love "pure" multichromes, I've also got a lot of love for multichrome shimmers like this. Instead of metallic smoothness, they have glowing depths. They're less audacious and more mercurial. Huginn & Muninn adds a dark, brooding beauty to the stunning shift. The formula is good, thick but smooth. I used two coats, but three probably would have been better. In full sunlight I could see a few thin spots. This wouldn't be an issue on shorter nails. 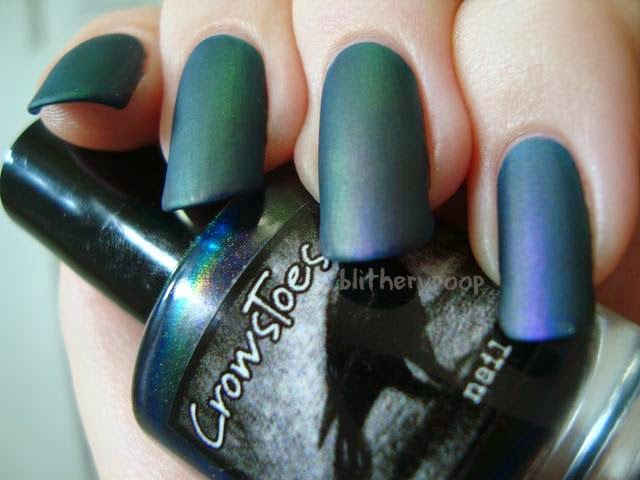 Its shift and dark base are similar to Nubar Peacock Feathers, which I always manage to forget to add to my wishlist. Now I guess I don't have to! From the swatches I've seen of peacock feathers, I think Huginn & Muninn is better. It's got a lot of personality. Sometimes you can see the indigo tones of the base, when the shift is subdued. The shimmer goes purple and soft gold then. Then suddenly it bursts into an otherworldly green! The blue end of the shift shows in the bottle, but not on the nail. I can't fault it for that. It's much shiftier than I'd even hoped and I really adore it! This next part should be a little predictable...mattified it! The depth is lost this way, but the shift becomes more defined. There's even a hint of that elusive blue! Bottom line: It's got so much to love! 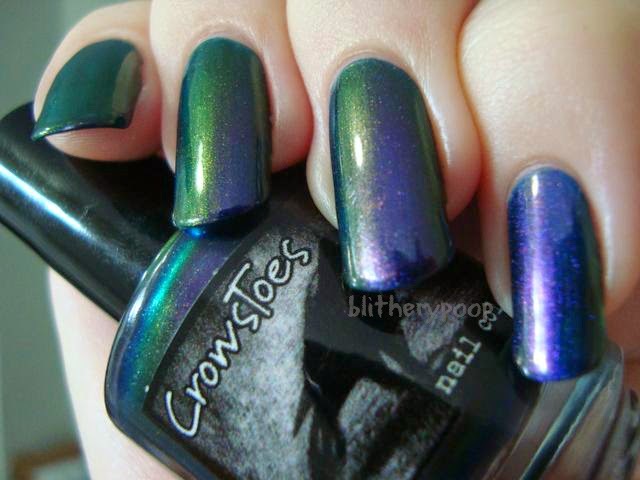 Smooth application, gorgeous shift, everything I want in a multichrome shimmer. I can definitely see myself buying at least a couple more from CrowsToes...maybe even a from the 9 Realms collection. It's tempting! Beautiful, I just ordered this pretty the other day! 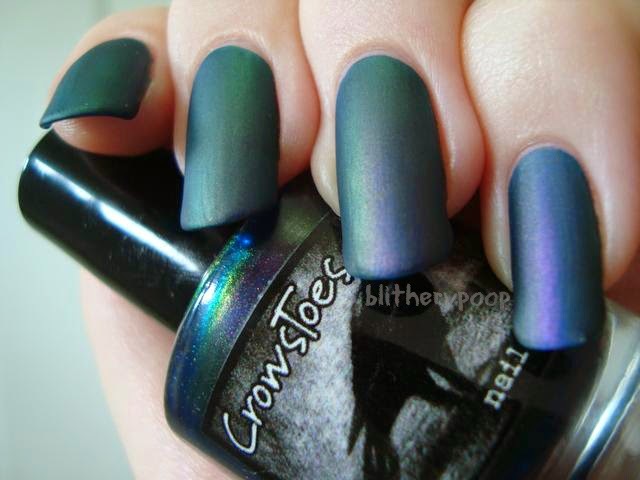 What matte top coat are you using here? Beautiful! I just ordered this the other day! What Matte top coat are you using?